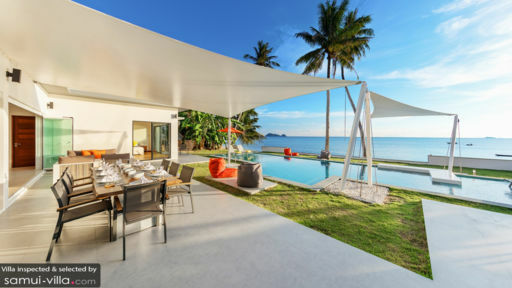 Villa Paradis Blanc or ‘White Paradise’ is a stunning modern take on a quintessential tropical home located on the western front of Koh Phangan, Samui. With a spectacular panorama that encompasses the ocean in the distance views of palm trees and lush foliage, and candy-coloured skies, this beachfront house is the ideal choice. 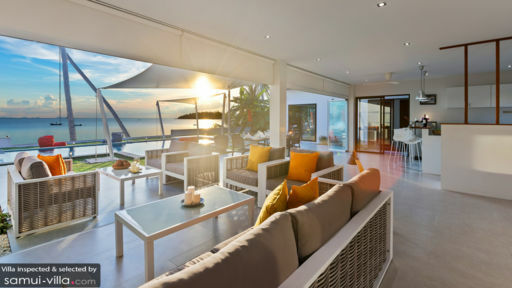 The villa is a family-friendly holiday spot with five bedrooms that are tucked away in two buildings connected by the main living and dining pavilions. An infinity pool overlooking the bay is where guests can spend days getting lost in the sunset view. Separated in two parallel buildings are five bedrooms at Villa Paradis Blanc each overlooking the splendid view of the ocean as well as the vast skies. The master bedroom or the ‘Honeymoon’ room is found in the first building on the upper level with a spacious balcony and ample privacy as well as a modern en-suite bathroom. The ground floor is occupied by two bedrooms with a shared bathroom ideal for families. They lead directly to the swimming pool. The second building houses the final two bedrooms at the villa, each offering private terraces and abundant space for you to relax and lounge while relishing the view. The bedrooms are air-conditioned with large windows so they are naturally lit during the day and offer serene views at dusk. Simply decorated with a piece of art and nothing else, these are luxurious, modern-day corners for utmost relaxation. At Villa Paradis Blanc, you can enjoy the sunny sky dotted with fluffy, white clouds and the infinite ocean that stretches far and wide for as long as you’d like. The infinity swimming pool sits majestically taking it all in with its inviting water willing you to dive right in. There are several bean bag chairs, loungers, and sun chairs in-built into the pool. Thebeach is a step away allowing you to squish your toes on its sandy shores. An alfresco lounge is found on the patio with comfortable wicker sofas and chairs. Right from the patio you can already be part of the open-plan living space as it is separated only via foldable glass doors. An entire indoor/outdoor space is great for a group of people so that you are able to make the most of the surroundings as well as the comfort of modern living. Firstly, you will be greeted by the comfortable seating area furnished with plush sofas, a flat-screen satellite TV so you can keep up with your favourite shows and watch movies. The living rooms is as contemporary as it gets with false ceiling lights, cutting-edge design, futuristic ceiling fans, and minimal décor. The western bar stands in the corner marking the entrance to a fully-equipped, swanky kitchen with sleek design and plenty modern amenities. Grab your cocktails before heading out to catch the sunset. The dining area at Villa Paradis Blanc is in fact found on the patio for a relaxing dinner under the starry night sky and a hearty breakfast against a brightly-lit world. The staff at Villa Paradis Blanc comes highly-recommended and their work is laudable since they provide world-class services to guests taking care to maintain the property as perfectly as you found it the first day. Ready to entertain any requests and requirements from your end, you are in for a treat. They will happily arrange for spa sessions in-house, day-trips along the coastal town, and even offer the services of a personal chef upon request. The peaceful surroundings of Koh Phangan are made all the more better since you can enjoy watching local fishermengoing about their day, working hard under the sun, and learning about their skills. Walk along Hin Kong’sshoreline for a spectacular view and a calm that surrounds you. There are plenty of restaurants offering authentic Thai delicaciesthat you can explore.